Baby Einstein creates products for your baby made from a baby’s point-of-view. Their products are meant to educate and aid in development, as well as provide entertainment to the baby in new and innovative ways. 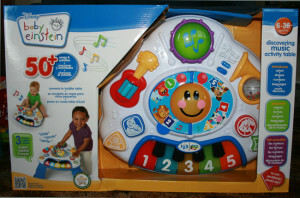 I received the Discovering Music Activity Table from Baby Einstein to review and we love it. 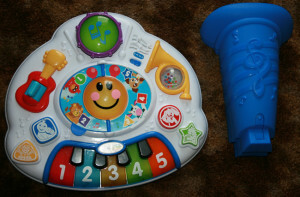 When the Discovering Music Activity Table came, I had to do what any parent would do if they were in the store deciding to buy the toy – I played with the toy before opening it!!! I couldn’t resist, I pressed all the buttons at least once. Every parent needs to test the toy first, right? Once I was done playing, it was time to let my son play. The first task was removing it from the box. This was super easy. Here is what came inside the box, three legs and the table. Your child can play with the Discovering Music Activity Table on the floor if they are too young to be able to sit up or stand up to the table yet. If they are older, you can attach the legs to the table so they can stand and play with it. I went ahead and attached the legs to the table to show how easy it is to put together. I can say, the legs are SUPER easy to attach and remove. Now that the Discovering Music Activity Table is assembled, let’s talk about some features of this innovative toy The Activity table has settings to speak in English, Spanish, and French. You can choose your desired language when you switch on the activity table. 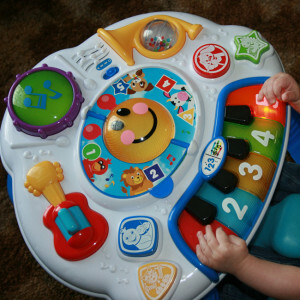 There are piano keys, shapes, and musical instruments that your child can interact with. As you can see, the piano keys are colored and have numbers on them. When in the discovery mode, you can switch between the numbers and colors feature. When your child pressed the keys, it will announce the color or number they have pressed followed by a little song. The shape buttons will announce the shape and color, what animal and what instrument is printed on the shape. The french horn and guitar will announce themselves and play a song. The drum will announce itself and then, when you press it again, will count. 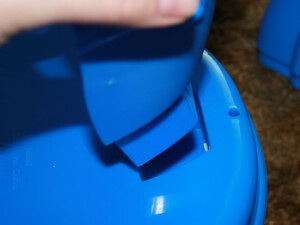 So if your child pressed the drum 5 times, it will count to 5 with drum beats as well. The table also has a free play mode. This mode will only play songs when any button is pressed. 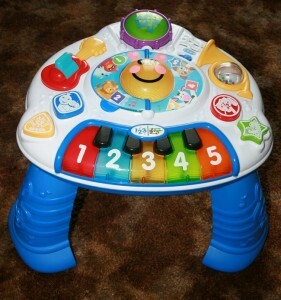 The Discovering Music Activity Table will light up as well. The piano keys, smiley face and drum are the areas that light up. This table is a fun way for your child to learn numbers, colors, musical instruments and music. It is for children aged 6 months and older. My son loves this table. He squeals with excitement when he plays with it. His favorite area is the piano and loves to press the orange key. I would have to say that could be his favorite color. Hi Lou! Sorry it took me a bit to get back to you. I was away visiting family and I wanted to make sure I told you right on the how to remove the legs. There is a small tab at the very top of the leg were it connects to the table. Push that in and pull. It should just pop right off. Let me know if you have any troubles and I will try and help better. I have two of these tables they are exactly the same except one has the tab to push to take the legs off and the other doesn’t? I bought them at the same time same place? Any advice? Hi the once I have doesn’t have anything on the leg ? How can I remove the leg without those tabs ? Wow, I can’t believe they would get rid of a great feature like that!! What about using a screwdriver to try and pry it out?? Just be careful not to break it. The table we have has the tabs so I have not tried this method of getting the legs off. ??? I am sorry so many people have been having this problem. If you find something that works, please let us know. Great! I am glad someone figured it out. I wonder why they changed the design to be so difficult.